4 Bedroom Detached House For Sale in Winchester for Guide Price £700,000. We are advised by the seller that this attractive Grade II listed property dates back to the mid 16th century and is believed to have historic purpose as a court house for the manor of Hursley. It has been sympathetically refurbished to provide an appealing family home which benefits from a wealth of period features including a pair of inglenook fireplaces, a plethora of exposed wall and ceiling timbers and lozenge windows to the rear aspect in the majority of rooms. On the ground floor the property boasts an attractive 25'7 sitting room with wood burning stove and a characterful dining hall with stripped wood flooring and exposed brick wall. Beyond the dining area is a kitchen breakfast room complete with Aga and brick pavor floor. The kitchen is complemented by the adjacent boot room and utility room which provides access to the rear garden and the ground floor shower room. A further reception area/bedroom four completes the accommodation on this level. There is also a converted basement which has previously been used as a study. On the first floor there are three bedrooms, two of which boast wonderful vaulted ceilings with impressive exposed timbers and stunning brick fireplaces. Bedroom one also has the benefit of an en suite w/c whilst a family bathroom serves the other bedrooms. 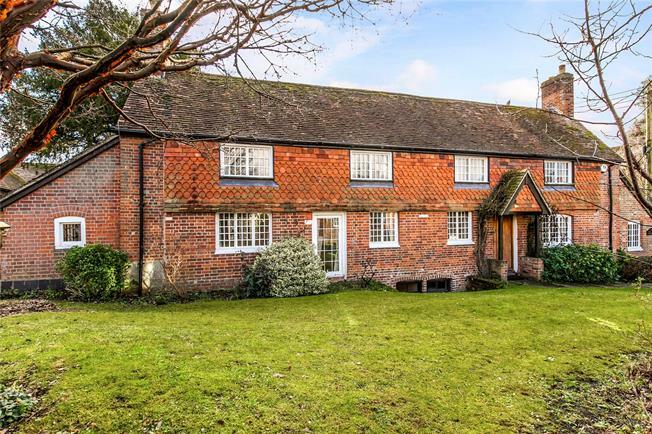 The property is situated in a tucked away position in the desirable village of Hursley. Day to day amenities are well served by the village post office store, butchers, two public houses, church and highly regarded John Keble primary school. The property also falls within Kings Secondary school catchment. Winchester lies approximately 5 miles away and offers a wider range of amenities and mainline railway services to London Waterloo (about 1 hour) and road communications are convenient with access to the A3 (M) and A272 with links to the A3 and M3. The village also benefits from an excellent public bus service. The property is approached via a pathway which leads through the front garden which is mainly laid to lawn with herbaceous borders incorporating a range of mature shrubs and plants. To the side of the property is a single detached garage with power and light supplied and parking in front. A gate provides access to the rear garden which is mainly laid to lawn with flower borders and fully enclosed. LOCAL AUTHORITY: Winchester City Council SERVICES: All mains services connected.